Frank Vincent Zappa (December 21, 1940 – December 4, 1993) was an American musician, composer, activist and filmmaker. His work was characterized by nonconformity, free-form improvisation, sound experiments, musical virtuosity, and satire of American culture. In a career spanning more than 30 years, Zappa composed rock, pop, jazz, jazz fusion, orchestral and musique concrète works, and produced almost all of the 60-plus albums that he released with his band the Mothers of Invention and as a solo artist. Zappa also directed feature-length films and music videos, and designed album covers. Publications such as Ultimate Classic Rock and The Independent have described him as one of the most innovative and stylistically diverse rock musicians of his generation. As a self-taught composer and performer, Zappa’s diverse musical influences led him to create music that was sometimes difficult to categorize. While in his teens, he acquired a taste for 20th-century classical composers such as Edgard Varèse, Igor Stravinsky, and Anton Webern, along with 1950s rhythm and blues and doo-wop music. He began writing classical music in high school, while at the same time playing drums in rhythm and blues bands; later switching to electric guitar. His 1966 debut album with the Mothers of Invention, Freak Out!, combined songs in conventional rock and roll format with collective improvisations and studio-generated sound collages. He continued this eclectic and experimental approach, irrespective of whether the fundamental format was rock, jazz or classical. 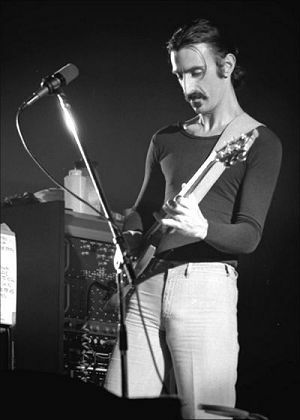 Zappa’s output is unified by a conceptual continuity he termed "Project/Object", with numerous musical phrases, ideas, and characters reappearing across his albums. His lyrics reflected his iconoclastic views of established social and political processes, structures and movements, often humorously so. He was a strident critic of mainstream education and organized religion, and a forthright and passionate advocate for freedom of speech, self-education, political participation and the abolition of censorship. Unlike many other rock musicians of his era, he personally disapproved of and seldom used drugs, but supported their decriminalization and regulation. During Zappa’s lifetime, he was a highly productive and prolific artist, earning widespread acclaim from critics and fellow musicians. He had some commercial success, particularly in Europe, and worked as an independent artist for most of his career. He remains a major influence on musicians and composers. His honors include an induction into the 1995 Rock and Roll Hall of Fame and the 1997 Grammy Lifetime Achievement Award. In 2000, he was ranked number 36 on VH1’s 100 Greatest Artists of Hard Rock. In 2004, Rolling Stone magazine ranked him at number 71 on its list of the "100 Greatest Artists of All Time", and in 2011 at number 22 on its list of the "100 Greatest Guitarists of All Time".